ASHRAE recently released new data center environmental specifications that support what the energy efficiency community has advocated for years. That is that data centers are tolerant to a wide range of temperature and humidity. 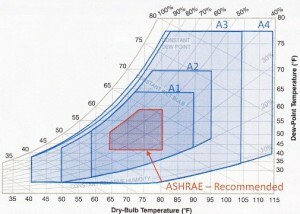 ASHRAE allows even class A1 data centers, which are recommended for the tightest control to have large swings in temperature and relative humidity. According to ASHRAE’s committee 9.9 for mission critical facilities, a class A1 data center can range in temperature from 59°F to 89.6°F and in relative humidity from 20% to 80%. This is very important for energy efficiency. This means that the energy efficiency of most data centers can be immediately increased by increasing the temperature and decreasing the minimum relative humidity. This reduction in minimum relative humidity will save energy at the humidifier as well as the cooling coil. If the dewpoint of the space can be reduced below the supply air temperature, this can eliminate the latent load at the cooling coils, saving significant cooling as well as humidification energy. Most importantly, the high maximum temperature and relative humidity limits will allow for significant hours of air side economizer operation. In some climates this may be nearly 100% of the time, especially with proper hot isle/cold isle arrangement and containment. For details on ASHRAE’s new data center specifications, view the committee 9.9 recommendations.